Austrian Constitutional Court (Verfassungsgerichtshof VfGH), the oldest constitutional court in the world, resided in the building of the former Böhmische Hofkanzlei (English: Bohemian Court Chancellery), Judenplatz 11 in Vienna until 2012. 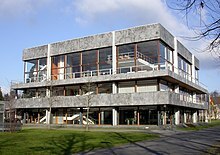 A constitutional court is a high court that deals primarily with constitutional law. Its main authority is to rule on whether laws that are challenged are in fact unconstitutional, i.e. whether they conflict with constitutionally established rules, rights, and freedoms, among other things. In 1919 the First Austrian Republic established the first dedicated constitutional court, the Constitutional Court of Austria, which however existed in name only until 10 October 1920, when the country's new constitution came into effect, upon which the court gained the power to review the laws of Austria's federal states. The Czechoslovakian Constitution of 1920, which came into effect on 2 February 1920, was the first to provide for a dedicated court for judicial review of parliamentary laws, but the court did not convene until November 1921. The list in this article is of countries that have a separate constitutional court. Many countries do not have separate constitutional courts, but instead delegate constitutional judicial authority to their general court system, with the final decision-making power resting in the supreme court. Nonetheless, such courts are sometimes also called "constitutional courts". For example, the Supreme Court of the United States has been called the world's oldest constitutional court because it was one of the earliest courts in the world to invalidate a law as unconstitutional (Marbury v. Madison), even though it is not a separate constitutional court, hearing as it does cases not touching on the Constitution. Prior to 1919, the United States, Canada and Australia had adopted the concept of judicial review by their courts following shared principles of their similar common law legal systems, which they, in turn, had inherited from British legal practice. (The United Kingdom itself does not have a codified constitution to be reviewed by such a court.) The Parthenopean Republic constitution of 1799, written by Mario Pagano, envisaged such a body ("eforato"), but lasted only 6 months. ^ Liptak, Adam (September 17, 2008). "U.S. Court Is Now Guiding Fewer Nations". The New York Times. Retrieved June 7, 2018. ^ Mauro Lenci, The battle over "democracy". In Oddens, Joris; Rutjes, Mart; Jacobs, Erik (2015-05-01). The political culture of the sister republics, 1794-1806: France, the Netherlands, Switzerland, and Italy. Amsterdam University Press. ISBN 9789048522415.